March is one of the best time to travel to Bhutan. The beautiful kingdom of Bhutan consists of high and steep mountains consisting of deep valleys with networks of swiftly flowing rivers. Moreover, rich in cultural diversity, Bhutan is also famous for its endless festivals that happen around the year. And, Bhutan in March is the best time to witness a variety of wildflowers in various parts of the country. With the winter season coming to an end and snow gradually melting away, March welcomes the return of spring. And, it is among the best time to visit Bhutan. During this time, the weather is just perfect. It is the most beautiful time of the year with a spectacular array of bright colors. This is the time when the valleys are green with fresh vegetation and fruit trees. How to Travel in Bhutan in March? The weather in Bhutan in March remains quite warm, sunny and pleasant. The temperature in the day is generally around 20 degrees. however, they do drop at night and so carrying jacket would serve you right. There are usually 8 hours of bright sunshine each day which represents 62% of the 12 hours of daylight. You can expect 34 mm (1.3 inches) of rainfall across the whole of March with 3 days with some rain falling. Since the climate of Bhutan varies in different regions. Let us look individually at the weather forecast for the month of March for most popular cities in Bhutan. Bhutan has a wide variety of accommodation options to choose from. But if you want to get your desired hotel in March, it is important to book in advance. It is because march falls in the spring season and is one of the peak seasons in Bhutan. So for accommodation, there are the luxurious 5-star hotels of Bhutan that offer incredible services. Also, there are the cozy little budget hotels that charm you with their simplicity. There are perfect traditional Bhutanese home stays as well that welcome you with utmost warmth and comfort. Hotels in Bhutan offer a fascinating blend of new age facilities, unequaled beauty, and rustic charisma. 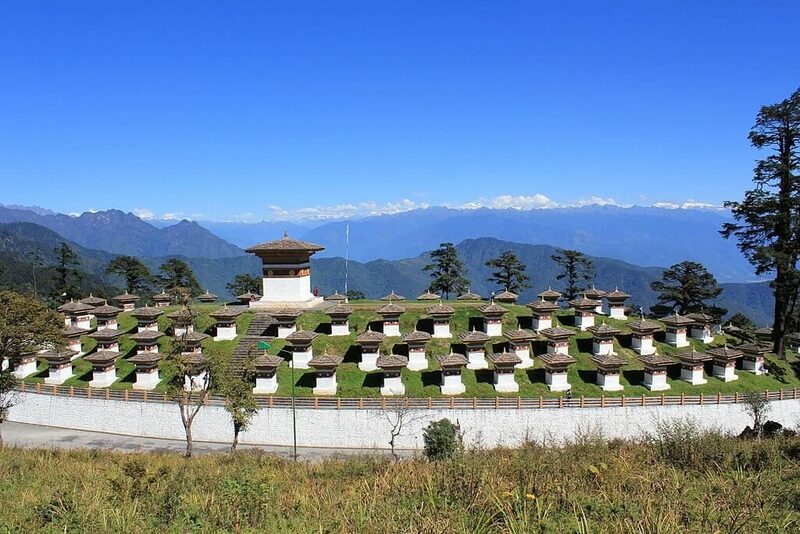 However, if you want to get a closer look into the Bhutanese lifestyle and culture you should opt for home stays for at least some days of your entire trip duration. Since March is the beginning of the spring season, Bhutan slowly starts to experience more tourists. And all the restaurants remain open with their wide variety of food options. Bhutan is unique in each and every way. The country will blow your mind with its charming scenic beauty, rich culture. And most importantly the flavorsome and delicious Bhutanese food. The aroma of the spices and the punch of chilies is sure to leave you salivating. Starting with the national dish of Bhutan, Ema Datshi is a very popular stew dish made with chilies, cheese, and various vegetables. It goes best with red rice. Also, you can try Phaksha Paa which is a classic Bhutanese stew made with strips of boneless pork or beef. They usually serve this with buckwheat dumplings along with seasonal greens. Red rice is one of the staple foods of the Bhutanese people. The earthy, nutty flavor of this rice is unique in its own way and goes very well with dishes such as Ema Datshi, Kewa Datshi, and Shamu Datshi. As for the drinks, you simply cannot leave Bhutan without tasting Suja or the Bhutanese butter tea. The people of Bhutan usually serve it after the meal. Also, you can try Ara, the traditional alcoholic beverage in Bhutan. They prepare this by fermenting rice, wheat, maize, and barley. For every tour in Bhutan, tourists have a Minimum Daily Fee that they have to pay for the entire tour. The MDF covers your accommodation, transportation, guide, food and entry fees to all the attractions in your itinerary. For peak months such as March, all tourists must pay USD 250 per person per day with a USD 40/30 surcharge per person for those in a group of one/two. While this may seem expensive, it does cover everything you require for a tour. Tours are prepaid so, you will only need money for drinks, laundry, souvenirs, and tips. For this, it is necessary that you bring cash. There are ATMs in most main towns, some hotels and shops accept credit cards, but only in major cities. However, keep in mind that cards are not widely used in Bhutan. So, it is best to carry enough cash that will last your entire trip. The fact that Bhutan does not have a railway network, the only way to explore the country is either by air or by road. Bhutan has limited domestic air services. And, since March is the peak season, it is important that you book your flight in advance. Some of the places which have air access are Bumthang, Paro, and Gelephu. As for the buses, public buses in Bhutan are very crowded. Moreover, the winding roads of Bhutan make them very uncomfortable and painful. Another option by road is by hiring a taxi. You will find taxis in Paro, Phuentsholing, Thimphu, and Jakar. Almost all the taxis will have meters but most drivers don’t use them. So, it is advisable to negotiate the rate before you set off. Hiring a car, however, is the best way to explore Bhutan. The local drivers know all the routes and also you do not have to concern yourself with driving. The Tiger’s Nest Monastery, also known as Paro Taktsang is one of the most esteemed pilgrimage places in Bhutan. This place offers great traditional values and is one of the best things to do in Bhutan in March. Located at the side of a steep cliff wall, about 900 m above the Paro valley, the monastery is extremely beautiful. In March, the sight of white building topped with shining golden roof amidst blue sky attracts you. And, thriving green mountains is simply beyond comparison. Although it is a steep two hours hike up to the monastery it is absolutely worth it. Moreover, in March, the weather is pleasant during the day in Paro. Hence, you can hike to the monastery with ease. Bhutan is rich with many dzongs (fortresses). And Punakha Dzong is one out of the lot and is a must see. It is the most beautiful dzong in the country and offers the eye-catching sight of the white walls on a clear sunny day in March. Moreover, ornate wood carvings and intricate paintings add to the charm of this remarkable architecture. The dzong is surrounded by flourishing green hills. And in March the lavender colored jacaranda trees add a beautiful contrast to its whitewashed walls. Apart from the structural beauty, the dzong also holds great historical and traditional importance in Bhutan. If you are someone who wants some thrill and excitement during your Bhutan trip you can gush into the rivers of the country. It is always fun to go for white river rafting and the rapids of Po and Mo rivers are ideal for moderate to the high difficulty level of white water rafting. March is one of the best time to take rafting and the whole adventure becomes even more impressive and memorable by the serene beauty. And pristine waters as you go under suspension bridges seeing various dzongs and Chortens. Bhutan has some of the world’s best treks, thanks to its proximity to the mighty Himalayas on its northern border. Moreover, March serves as a great time to do the treks due to its pleasant and dry weather. One of the best treks to take is the Jhomolhari trek, which attracts visitors from around the world for its stunning views of Mt. Jhomolhari. In this trek, you will cross passes that reach almost 5000m. It is a moderately challenging trek that take around 8 days. Another trek to do is the Druk Path trek. It is one of the best introductory treks in Bhutan. It starts near Paro and takes across the mountains to Thimphu. The highest point of the trek lies at around 4200m. While on the trek, you walk through some of the country’s massive pine forest and large alpine lakes along the way. To add more, with lush low valleys fringed with high alpine mountains, Punakha has become the center for trekking in Bhutan. And you can take various treks in the Punakha region which are usually short lasting for around 3 to 4 days. Paro Tsechu: The five day Paro Tsechu takes place every Spring, usually late March at the Paro Dzong. This Tsechu is one of the largest festivals in Bhutan. The pilgrims travel from neighboring districts to take part in the festivities. 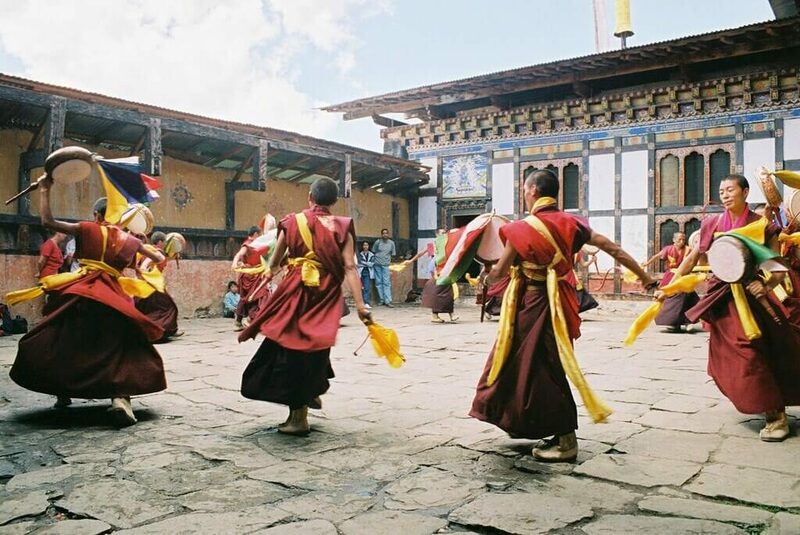 The first day of the festival usually takes place in the courtyard of the Dzong and includes dances such as the Black Hat Dance. Or Dance of the Lord of Death and his Consort. On the final day, you will witness a giant applique Thangka unrolling before dawn. Gomphu Kora Tsechu: Gomphu Kora is one of the temples where Guru Rinpoche, the great tantric mystic, meditated. It is a small temple in front of a huge black rock. Each spring, people from all over eastern Bhutan descend upon the narrow valley. They dress in their finery to take part in the festivities, to worship and reconnect themselves with their past. Traditionally, this festival was an occasion for the people of eastern Bhutan to choose their spouse. The official language of Bhutan is Dzongkha. Yet, most Bhutanese are quite fluent in English. The official currency of Bhutan is Ngultrum(Nu), which is equal to the value of Indian currency, that is INR 1=Nu 1. Bhutan has banned the sale and consumption of tobacco. Smoking is strictly prohibited in public places. However, consumption is not completely forbidden, so in case you want to smoke please carry your own cigarettes. Bhutan considers Tuesdays as the national ‘dry day’, and so the sale of alcohol is absolutely forbidden. They also consider Tuesdays as ‘Pedestrian Day’. Hence they don’t allow private vehicles on the road and they encourage people to use bicycles or walk. Do not drink tap water in Bhutan, make use of bottled water. Voltage in the country is 220/240 volts AC, 50 Hz. The country has winding roads, so be sure to carry motion sickness medicines. While visiting temples and other places of worship, be sure to dress modestly and respectfully. Bhutan is a paradise for a photographer, but do ask before you take a picture esp of Bhutanese people, monasteries, dzongs etc. In case of an emergency, dial 112 (Ambulance) or 113 (Police). Since March is a peak season, make sure to book your flights and hotels in advance to avoid a rush. After the cold winter season and before the monsoon sets in, Bhutan experiences Spring. March is an ideal time to visit Bhutan. With trees regaining its lush green color and the flowers blooming, the view of Bhutan is March is nothing but a visual treat for the eyes. Moreover, the pleasant weather makes it a great time for any outdoor activities in Bhutan. For further question and queries, please feel free to contact us. It is our pleasure to guide and assist you in planning the trip.